On my way back from Java I had a stop over in Bangkok, and had an invitation from Ajahn Thammarat to stay at Wat Theptitaram, which is almost opposite Wat Saket. I had met Ajahn a couple of years previously while photographing at the temple, and he invited me to stay with him whenever I was in the city. Ajahn is regularly making appearances on the World Buddhist Television, which, despite its name, is mainly a Thai TV station run from Wat Yannava south of the river, not far from the Thaksin Bridge. He invited me to go along and be interviewed for the Channel, and as it gave me an opportunity to speak about some new books I had published I agreed to go. The interview was no great shakes, as everything had to be translated into Thai, but afterwards I was able to have a good look around the temple. 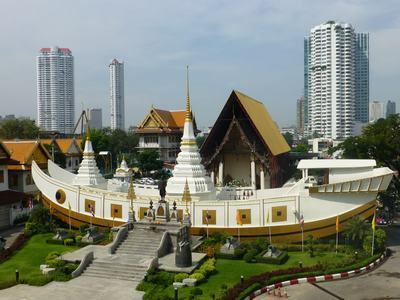 The temple is principally famous for the concrete Chinese junk built by King Rama III, which houses two chedis on its deck, and is situated in the main courtyard. It was built as a memorial of a fast-disappearing sailing craft. In one of its side buildings it also houses one of the most extraordinary collections of relics I have seen. The atmospheric room is beautifully light and also contains many statues representing not only Theravada ideals, but also Mahayana Arhats and Bodhisattvas, Chinese gods, and statues of many famous Thai monks known for their supernatural powers. The Reliquary section though is the outstanding feature in the room, purporting to house relics not only from our Sakyamuni Buddha, but also from past Buddhas, Paccekabuddhas, Arahats and famous monks. It is probably the largest such collection I have seen assembled in one place, and I went round happily photographing it all, before being told that photography was not allowed! Happily this was soon over-ruled by another of the authorities present because of my monk status, and I was able to finish the work. However it probably means that this is the only such collection of photographs from the temple available. Most tourists simply see the boat and go but if you are interested in such things as reliquaries, then I would encourage a visit.